Yesterday my fiancé and I did our engagement photo shoot with Mir of Mir Anwar Photography. The boat that we rented was actually docked at Humber Bay Shore – where SM proposed to me two years ago! 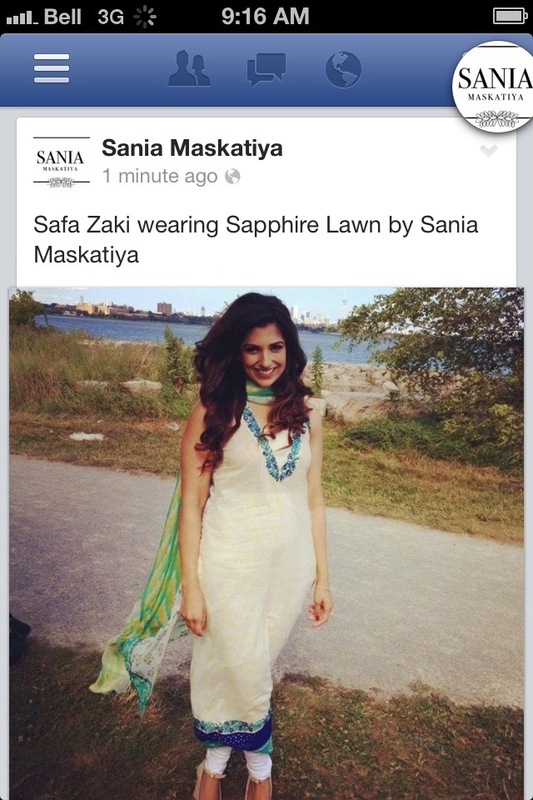 This suit is from Sania Maskatiya’s 2013 Lawn Prints, Summer Saphire Collection, that I bought when I was in Lahore this March. My mom was the one who suggested I wear it (“Don’t buy new dress; learn to save money”) so I tried it on and thought that it totally works. I liked that I got to profile how stylish something as simple and staple Pakistani Lawn wear has become with the silk dupatta, and the appliqués. Summera of Summera Studios did my hair and makeup for the shoot. Since I had three different outfits of varying colours, we decided to stay neutral with the eyeshadows and do a pink lip. I think she did a great job of keeping the makeup fresh! I’ll do a proper post all about the shoot, photography with Mir and share some shots from the session soon!